An SQL JOIN clause combines rows from two or more tables. It creates a set of rows in a temporary table. How to Join two tables in SQL? A JOIN works on two or more tables if they have at least one common field and have a relationship between them. JOIN keeps the base tables (structure and data) unchanged. JOINs are faster than a subquery and it is very rare that the opposite. In JOINs the RDBMS calculates an execution plan, that can predict, what data should be loaded and how much it will take to processed and as a result this process save some times, unlike the subquery there is no pre-process calculation and run all the queries and load all their data to do the processing. A JOIN is checked conditions first and then put it into table and displays; where as a subquery take separate temp table internally and checking condition. When joins are using, there should be connection between two or more than two tables and each table has a relation with other while subquery means query inside another query, has no need to relation, it works on columns and conditions. The SQL EQUI JOIN is a simple SQL join uses the equal sign(=) as the comparison operator for the condition. 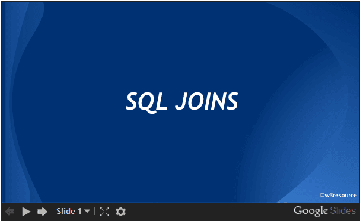 It has two types - SQL Outer join and SQL Inner join. The SQL NON EQUI JOIN is a join uses comparison operator other than the equal sign like >, <, >=, <= with the condition. This type of EQUI JOIN returns all rows from tables where the key record of one table is equal to the key records of another table. This type of EQUI JOIN returns all rows from one table and only those rows from the secondary table where the joined condition is satisfying i.e. the columns are equal in both tables. b) Name of the columns of two or more tables, based on which a condition will perform. table1, table2 Tables participating in joining. join_type Type of the join. join_condition Some condition. This is optional.